If simply viewing a beautiful piece could trigger an emotional response, what impact could be mustered by artwork imbued with a social message? Forming matter to speak wordlessly was my next challenge, under the tutelage of Lincoln Mudd at Montgomery College, who brilliantly combines patient instruction in technique with boundlessly high expectation, achievement of which is greeted with the faintest, yet rewarding, cast to the eyes. One afternoon, hurrying to my car, I deviated my stride to skirt a homeless man sprawled on the sidewalk. My sense of annoyance smashed up against the realization that my concern for a clear walking path negated regard for another living, breathing–and yet suffering–human. I came to a standstill. How insidiously twisted our values become when extruded through the press of our daily, busy lives. And thus, was born Surplus. 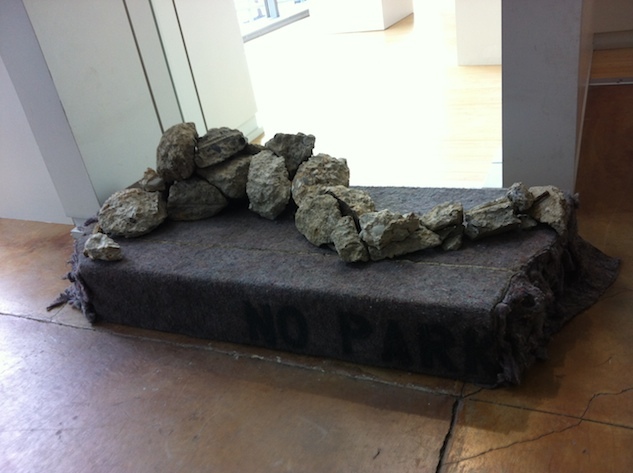 How perfectly apt to fashion a sidewalk segment out of a homeless man’s blanket, its material suppleness mirroring the vulnerability of human flesh, while conjuring the body of a reclining homeless person with concrete rubble from a Chevy Chase sidewalk, itself shattered and displaced.